Alnwick Castle dates back to the 11th century, although heavily restored in the 18th (by Robert Adam) and 19th (by Antony Salvin). 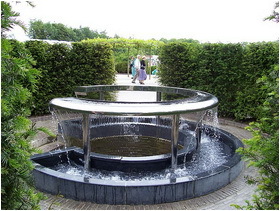 The grounds were laid out by ‘Capability’ Brown, and have been recently restored to include a central Grand Cascade of fountains and a magnificent Rose Garden, featuring the raspberry-scented Alnwick Castle Rose. 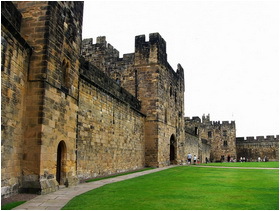 Since 1309 Alnwick Castle has been the home of the Percy family, earls and dukes of Northumberland. 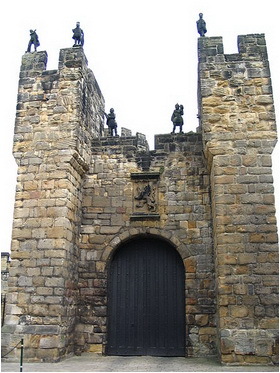 The 15th-century Hotspur Tower (part of the town walls) takes its name from the nickname of Harry Percy (1364–1403), who plays a part in Shakespeare's Henry IV, Part 1. The castle has been nicknamed the Windsor of the North for its perceived similarity to Windsor Castle when viewed from a distance. Alnwick Castle is the title of a once-popular historical romance published in 1822 by the American Knickerbocker poet, Fitz-Greene Halleck. 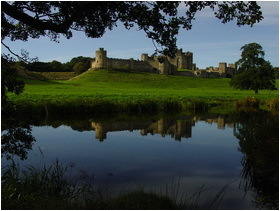 A popular location with film makers, the castle has featured in Robin Hood: Prince of Thieves (1991), Elizabeth (1998) and in some of the Hogwarts scenes in the Harry Potter films (2001 onwards). 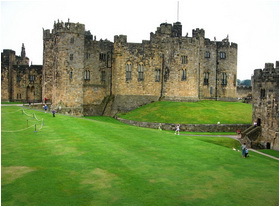 Alnwick Castle Tickets prices - Includes: State Rooms, Knight's Quest, Dragon's Quest, the Castle Courtyard, Grounds and Museums. For your information an Adult ticket will cost you £13.00, a Children ticket: (age 5-16) £6.00 and a Family ticket £34.00. Combined tickets are also available for the Castle and the Garden. Adult ticket is £22.00, tickets for 5 to 16 children are £6.00, for Children under-5s just 1p and a Family ticket is £50.50. For group visitors the tickets are discounted and they must be booked in advance. 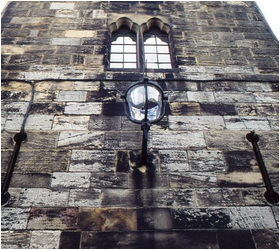 Email: groups@alnwickcastle.com / Tel: 01665 511184.